I don’t think of myself as a data junkie, but get me near sports physiologists wielding fancy tools and I positively swoon. While in The Woodlands covering Ironman Texas, I had the chance to get two tests done at the brand-spanking-new Memorial Hermann Ironman Sports Medicine Institute. With my hour of free time on Saturday, I trotted down to the Institute, conveniently located right next to my hotel. Destiny? I think so. My body fat and blood lactate were just begging be tested. 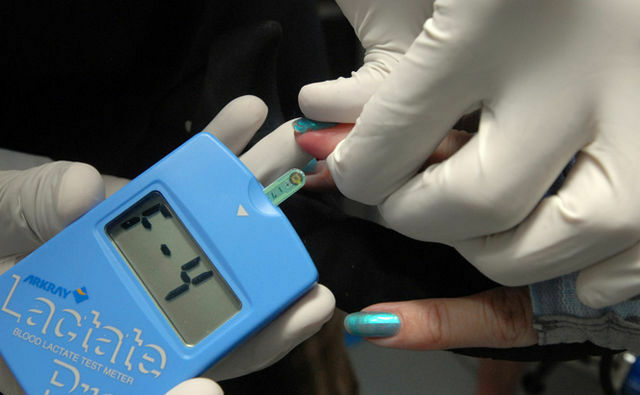 The first test that quite literally tells you what you’re made of. My tester Alyson ushered me into the egg-like “BodPod” and popped a little cap on me to keep radiation away from my brain. I’ve tested myself via the skin fold method (calipers), and with bioelectrical impedance analysis (bathroom scale), but never had a chance to try one of the more accurate fancy-pants methods. Called air-displacement plethysmography, the BodPod is a quick and dirty way of seeing how much space you take up in the world. I was a little wary of the results. Lately I’ve been trying to practice the discipline of letting go of my concern with weight. But deep down, of course I do. For a lot of women—and as I’m finding, more and more, endurance athletes—those numbers are connected to psychological issues I won’t go into here, nor am trained to. Two months post-Ironman, in the middle of my mini “mid season off season,” I really had no idea what I’d see on that scale at 2 o’clock in the afternoon. The damage? My numbers put me in the “Ultra Lean” range. (The other options include Risky/High, Excess Fat, Moderately Lean, Lean, Ultra Lean, and Risky/Low.) I learned that I burn 1465 calories at rest (about what I’ve been going by), and that even on a non-training day, regular daily activities will burn an extra 600 calories on top of that. On training days, the number will shoot up to 2500-plus calories. *Alyson, my new best friend, informed me that she rarely sees women “score” numbers greater than 100 here. I had my V02 max tested two years ago but haven’t had the chance again since. Unfortunately, the Institute’s V02 equipment wasn’t quite ready (that’s how new the facility is), but Alyson assured me that blood lactate was her favorite anyway. I jumped on a treadmill, Alysson ready with the finger pricker, her assistant manning the controls. For 45 minutes, I was a dutiful lab rat: Run (easy) for three minutes, report rate of perceived exertion (RPE) on a scale of 1-10, give blood. Run (a little harder…) for three minutes, report RPE, give blood. Run (a little bit faster now…) for three minutes, report RPE, give blood. Rinse and repeat. “Really, you can tell?” I asked. I finished the session with two final minutes at a 10 RPE. I hadn’t been looking at pace, and when I found out I’d been running a 6:23, was a little disappointed. I felt like I could’ve reached at 6:10 or so, but who knows. Alyson sat me down to go over my data. 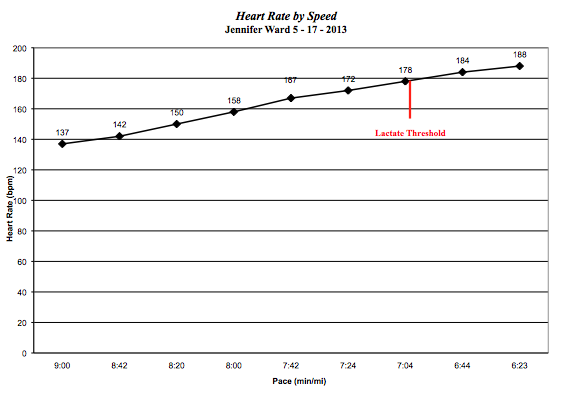 Interestingly, and as she predicted, my blood lactate was high for the warm up interval. This was because I’d done a hard workout the day before, and still had lactate in my muscles. Once my system cleared that out, we got more accurate readings. Alysson had so much to say about my results, and I’m kicking myself for not recording her. Thankfully, I can call or email her anytime, and Wikipedia exists. I should be OK. I’d never heard of pyruvate before, the fuel your body makes from glucose to supply your muscles when oxygen is present (aerobic work). When oxygen is no longer present (for me at a 178 heart rate, pace of 7:04, RPE of 9), pyruvate ferments into lactic acid. I was excited to find out that my body ferments stuff. Turns out triathlon has stoked the biochemistry fires deep within me. 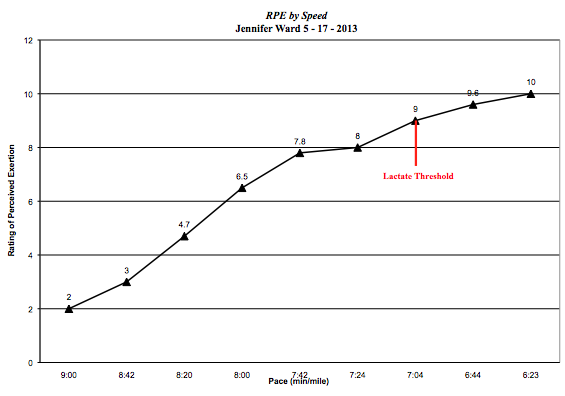 She also praised me for my pace awareness accuracy. I reported a RPE of 9 (chart 2) right about where I should have. Going over my tests with coffee before my flight home. I’m not sure what I’m going to do yet with my new arsenal of heart rate zones and paces. Maybe I’ll use them to try a new approach to training in my build up to Vineman 70.3, now that I’m not officially “with” a coach. I’ve never trained diligently by heart rate, so it might be interesting to see if I make significant progress. No matter what, I found the process interesting and informative and would do it again in a heart beat. Ha. 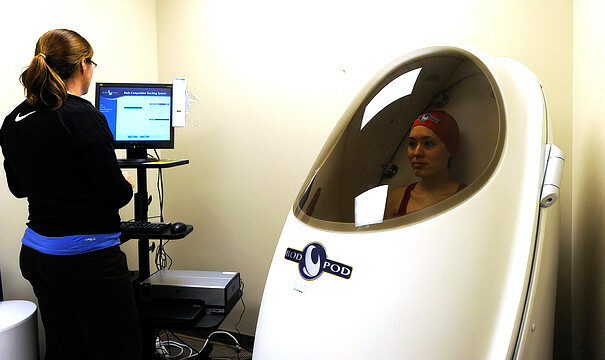 I’ve done the bod pod a couple times… both were during my CrossFit days, so now I’m curious to see what they are during IM training. Adding to the to-do list! 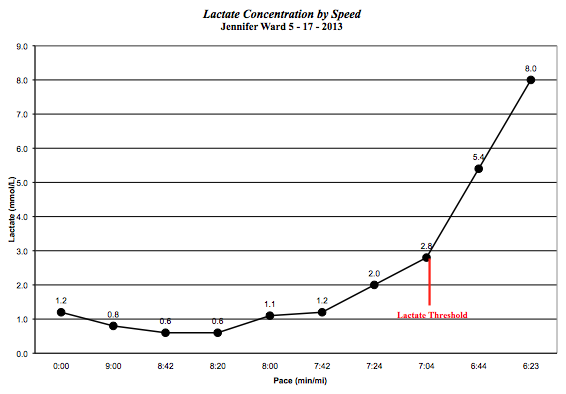 I haven’t had my blood lactate testing, but it looks interesting! A marathon at 7:42 pace is FAST! Also, I’ve been training by heart rate this year, and it’s been really cool to see my progress!